When I received the KBShimmer Birthstone Collection to swatch, I couldn’t help but notice that the polishes looked pretty similar to the ILNP Holiday Collection. As the days passed and word of the new KBS Birthstone Collection was spreading, others in the nail community were wondering – “Just how similar are they?” Well you’re about to find out! Since the ILNP Holiday collection only has six Ultra Metallics, I picked six from the Birthstone Collection to compare and here’s the line up – Ruby, Blue Topaz, Emerald, Citrine, Amethyst, and Peridot. All swatches in this comparison are two coats with no top coat. All photos were shot under a combination of Cree daylight and LED bulbs using a Samsung NX300 camera. Cherry Luxe is described as a rich Christmas red while Ruby is a warm blue toned red. Time In A Bottle is a vibrant aquamarine – leaning blue while Blue Topaz is an icy blue. ILNP Lucky One is a vivid pine green and KBS Emerald is a rich grass green. Emerald is more of a true green than Lucky One… but not by much. ILNP Empire is a true gold while Citrine is a vibrant golden yellow. From the bottle, these two look similar but once on the nail – huge difference! ILNP is a warm palatinate purple while Amethyst is a cool toned purple. In certain lighting, these two looked practically identical! Both of these polishes are lime green in base – Limelight is a brighter shade with Peridot being more pale. Overall, there were two distinctive differences between the KBShimmer Birthstone and ILNP Holiday polishes that I found. 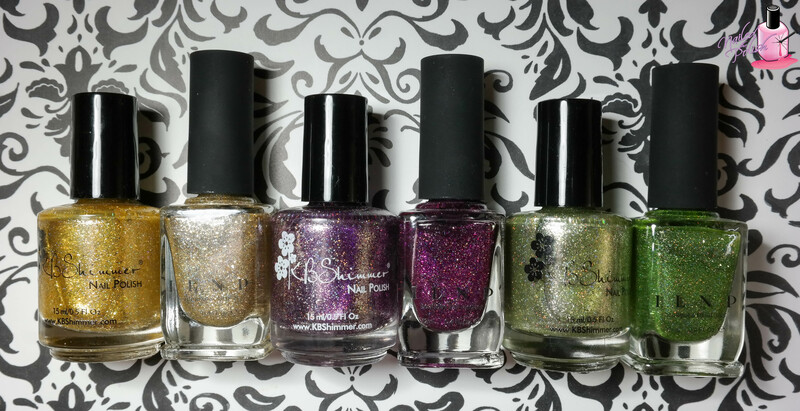 The ILNP polishes have larger silver metallic flakes while KBShimmer’s are much smaller. When compared to each other, the flakes in ILNP stand out more in their bases and gives these polishes more of a contrast and depth. Although the flakes in the KBshimmer polishes are much smaller in size, it actually makes the Birthstone polishes more reflective and shinier than the Holiday polishes. The ILNP Holiday polishes have holographic pigment added into them which gives these polishes a linear holographic effect. The holographic in the KBShimmer Birthstone polishes is more of a micro holographic glitter – giving these polishes a scattered holo effect. As far as formula, consistency, and application goes, all are fantastic! The only difference to note is that the KBShimmer Birthstone polishes dry faster than the ILNP Holiday polishes which I’m assuming is due to the size of the silver flakes. Both collections are currently in stock and available for purchase. 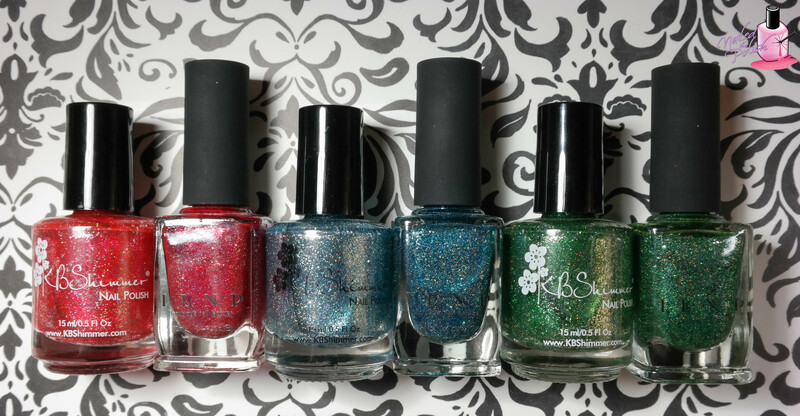 KBShimmer Birthstone Collection is available here and ILNP Holiday Collection, here. So what are your thoughts on these two collections? Do you prefer one over the other or a mix of both? All polishes compared were originally provided for my honest review. You’re very welcome! It’s so much easier to see the comparison when they are right next to each other. I wanted to make this post for that exact reason – there’s nothing worse than ordering polishes only to find out that they are dupes of ones you already have… lol! I totally agree with your preferences except for the gold. I just think KBS looks more like Citrine. But I think they are all beautiful. They must be hard to capture in a photo but you did a wonderful job with the comparisons. Have you seen Julep birthstone polishes? I own a few of them. I have a feeling that these are easier to remove than the Julep ones. Thanks. Fantastic post and an excellent resource for fans of these two wonderful indie brands. Your personal evaluations are invaluable. This took some work and I appreciate it! Thank you so much!! I’m really glad that you enjoyed the post!